Female genetic hair loss looks different than male genetic hair loss. In men, the frontal hairline progressively moves back. The crown is often affected too. 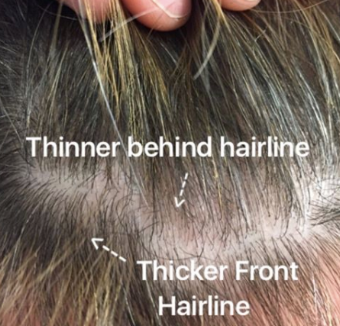 In women with genetic hair loss, the very frontal hairline is usually not completely lost. A band of hair is seen in the front and more prominent hair loss occurs behind that band.